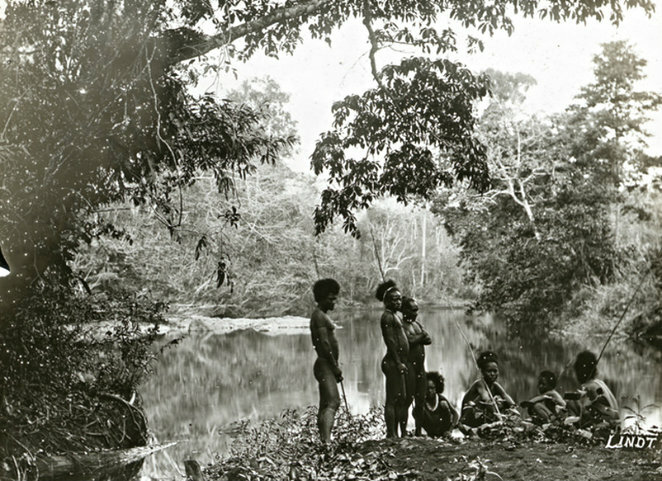 'Near the camp, Laloki River', 1885 Central Province, PNG. Photo: J W Lindt. The Points of Focus: Historic photographs from the Pacific exhibition runs from the 1st of August to the 20th of September 2015 from 10am to 4pm from Tuesdays to Sundays at Burrinja Gallery, cnr Glenfern Road and Matson Drive, Upwey. The cost is $5 per person, but it's free to local residents and Jarmbi members. There'll also be a curator talk on Sunday 16 August 2015 at 2pm. Curator Rebecca Conway studied Australian Aboriginal and Pacific archaeology at the University of Sydney (for the Macleay Museum) and has 20 years of experience working with archaeological and ethnographic collections in museums. 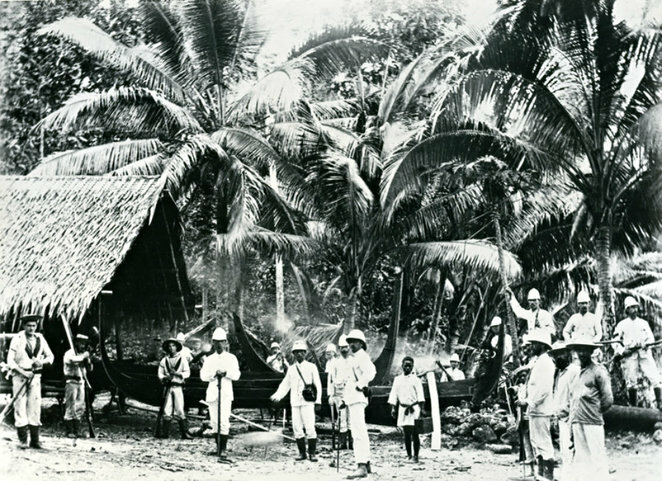 Punitive action, crewmen of the HMS Royalist torching canoes, 1892 - 1892 (possibly) Roviana, Western Province, Solomon Islands. Photo: Crew or passenger of HMS Royalist, copy print donated by B Bowden. Originals held by Fiji National Museum. Come along and experience moments of Oceanic history through rare photographs of early colonial life in the Pacific paired with works from Burrinja's collection of unique Oceanic ceremonial objects. Images exclusively from the Macleay Museum's collection and curated by Rebecca Conway for the University of Sydney, they span from the late 1850s and close to a century whereby the vibrant hues of the Pacific were captured by a camera in shades of black and white. This exhibition explores how photographs shape our understanding of the past, using the work of colonial government, missionary, scientific and commercial photographers as points of focus to examine aspects of Pacific history. Irobaoa, wealthy elder of Su'uafa, wearing dala head ornament and dolphin tooth necklace. 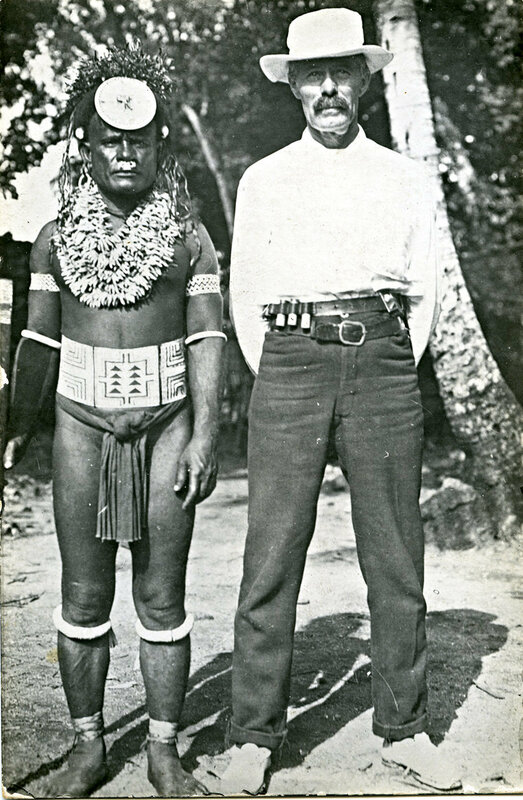 European man is possibly a plantation owner or trader, late 19th early 20th century Malaita, Solomon Islands. Photo: unknown photographic postcard donated by Burns Philip Company. Burrinja holds one of Australia's significant oceanic art collections as part of the McLeod gift collection, donated by local artist Neil McLeod, a keen field collector of Papua New Guinean ceremonial art for many years. "Many of the works are extremely rare and of invaluable ethnographic significance and constitute a valuable repository of evidence of rapidly disappearing cultures. My wish is for this unique resource to remain in the Shire of Yarra Ranges where it will be an enjoyable asset for local people and visitors to the hills and so that it may educate and foster understanding of the creators of the works". Neil McLeod, 2001. Why? Exhibition of rare photographs of early colonial life in the pacific. Cost: $5 per person, but it's free to local residents and Jarmbi members. This looks to be fascinating and a must see. Thanks for sharing, Jen.